Lot 587. P. Calpurnius. 133 B.C. AR denarius (22 mm, 3.78 g, 9 h). Rome. 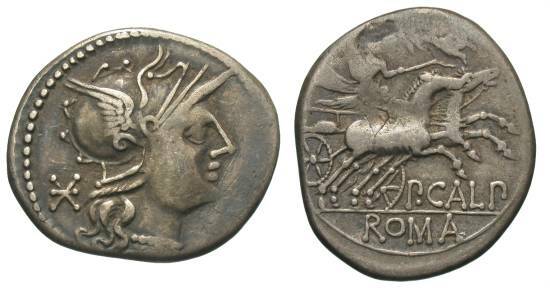 Head of Roma right, wearing winged Phrygian helmet; to left, value mark / P CALP / ROMA, Venus driving fast biga right, crowned by Victory flying left above. Crawford 247/1; Sydenham 468; RSC 2; RBW 1017. Toned. Nearly very fine.